Another Kind of Nerd: "each step is like a vasectomy." "Each step is like a vasectomy," said the teenage dude walking up the Miner's Track of Mt. Snowdon. Yes, that is something I actually overheard whilst making my merry way down the Miner's Track path. Let me set the scene: the Miner's Track of Mt. 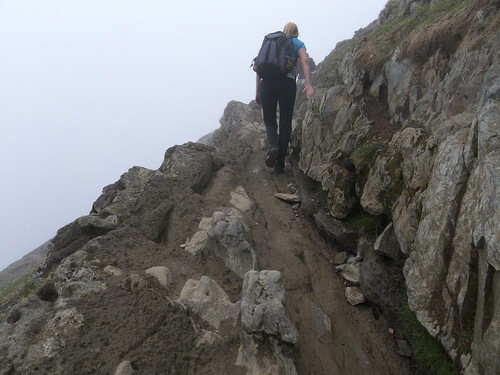 Snowdon is mostly easy-peasy, lots of gentle incline and mountain lakes, with a straight up-hill climb that last bit. I don't want to down-play it. It took us 2 hours and 40 minutes on the way up to the top and only 1 hour and 50 minutes on the way down. And there were points where I was quite, quite glad that it was, in fact, misty and cloudy; vertigo being what it is. * But a vasectomy? Surely that uphill climb is easier than a vasectomy. Even to those given to hyperbole. After chuckling at the fellow I found I just wanted to call him a pansie. Yes, he had the decency to be embarrassed that 4 women witnessed that complaint. But still. Pansie. Yes yes. Life is good. * I reserve the right to use commas and semicolons as I please. Actually, a vasectomy only takes about 15 minutes and the doc uses local anesthesia. So that guy clearly needed to try to find a better point of comparison.